A new community organization is seeking to offer lonely children the opportunity to make friends and teach other children compassion and inclusiveness. The "Friendship Bench Project" is installing benches at area schools where children who need a friend can sit and wait for a classmate to engage them. 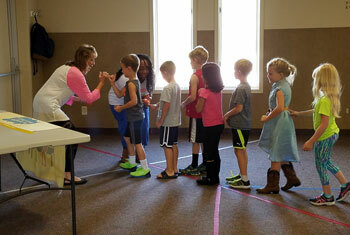 The group has been hosting assemblies at area schools to teach schoolchildren about avoiding bullying behaviors, being compassionate, and offering their time and friendship to a child who might be feeling left out. Mary Schierholt, and Marie Fay. 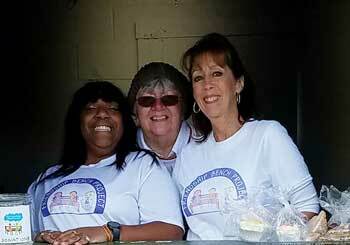 The initiative was created by Yvonne Bess-Jones and former schoolteachers Marie Fay and Mary Schierholt. Yvonne's move to the Ludington area in 2012 with her son started the ball rolling into what this project has become today. Both she and her son, Andrew "Juice" Jones, felt the loneliness of swiftly moving to a new town when they first arrived. But when Mary met Yvonne at a Ludington High School basketball game in which Juice was playing and invited her to sit in the bleachers beside her, an instant friendship began. Mary's act of kindness inspired Yvonne to help area children feel that same sense of inclusion. 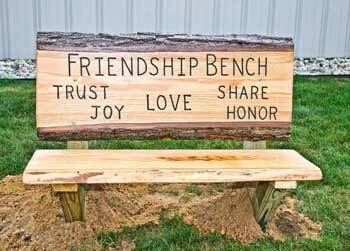 When Yvonne met Marie Fay while working at Ludington Woods and caring for Marie's mother, the Friendship Bench Project was born. As of May 2018, benches have been placed at Lakeview Elementary, Foster Elementary, Pere Marquette Pre School and Ludington Area Catholic Schools in Ludington, Covenant Christian, Mason County Central Upper and Lower Elementary Schools in Scottville, Pentwater Elementary, plus coming in September, Mason County Eastern and Baldwin Elementary. The group is currently in the process of becoming a 501(c)3 tax exempt organization and donations can be made at any West Shore Bank branch by contributing to the "Friendship Bench Project". The group also sells bracelets and t-shirts in order to raise funds. For more information, contact Yvonne Bess-Jones at (707) 344-3843 or Marie Fay at (231) 930-7207 or visit facebook.com.